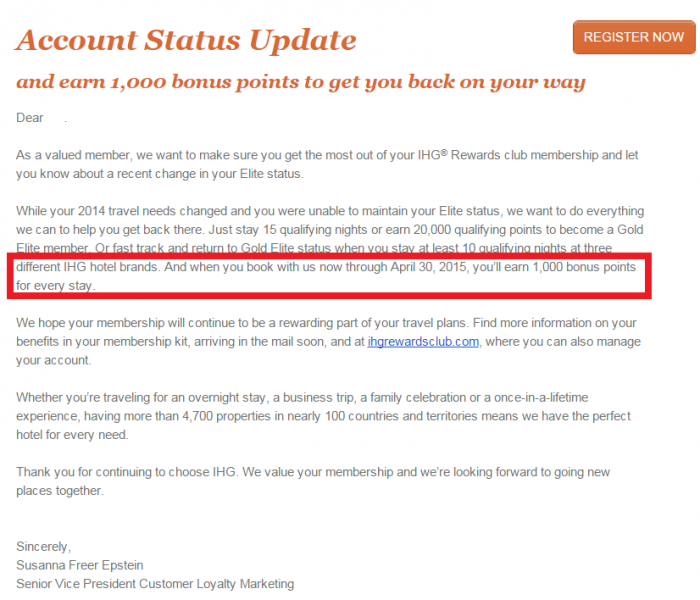 IHG Rewards Club has a new “Kick Start Club” promotion targeting those that lost elite their status in 2015. The email advertises the Gold elite fast track offer and comes with a sweetener of 1,000 bonus points per stay between February 16 and April 30, 2015. You can access and register for this offer on IHG’s website here. Note that it seems that whoever programmed the promo dates at the IHG’s end missed the fact that the offer is ending on April 30, 2015, and not on 20th. Considering who is now signing these IHG Rewards Club emails, it makes me wonder what happened to Don Berg? I really like these 1,000 bonus points per stay offers that are valid for few months. They used to be prevalent. There are not terms and conditions attached to this offer on the email that IHG Rewards Club sent out.